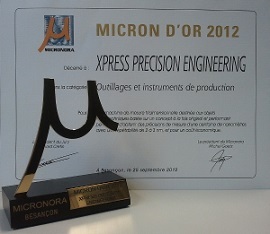 TriNano wins 2012 Micron d'Or. A jury consisting of experts from both industry and academics regarded the TriNano CMM as "the indisputable benchmark of innovation" from all new products presented in this category at the trade show. Ernst Treffers, Director Business Development of Xpress, received the award from the French Minister of Industry, Mr. Estrosi. "We are happy to be honored with this award", says Mr. Treffers. "We envisioned and developed TriNano as the first nano CMM that can be used in both an academic and industrial setting. When one wants to measure small parts with nanometer uncertainty, there is not always (financial) room for an exotic solution. We are glad this is acknowledged by experts from one of the most important micro technology regions in the world. For more information, visit the Micronora website.